(VEN) - Hanoi, 16th December, Microsoft and Vietnet Information Technology center (Vietnet – ICT) have jointly organized YouthSpark Live Event 2016. YouthSpark Live is a Microsoft's global campaign to provide young people global-wide with necessary technology skills which will accelerate them forward, and get connected to programs that will help them get there. 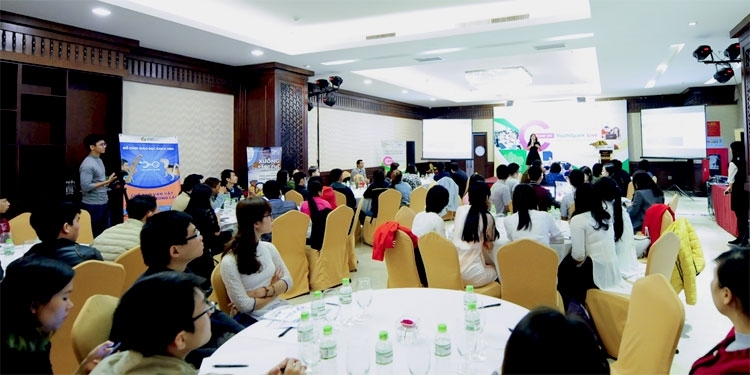 With the aim to inspire youth to get connected, integrated, and develop themselves with technology, YouthSpark Live provided participants with opportunity to network, and exchange views with outstanding Vietnamese and international experts in technology sector. Over 100 students from secondary-high schools, vocational schools, and universities participated in the event. At YouthSpark Live 2016, participants have chances to experience activities that help improve their computational thinking, such as “Computer Science Unplugged activities”. Participants get trained on using technology tools, such as Office Mix to support their study. Beside, in a panel discussion on “Factors to encourage the youth to explore and use technology for study and career development”. In which, ICT and STEM experts have sent a strong message that technology is the foundation for much of today’s innovation, young people should explore and use it to develop themselve and contributing to improve national economy. On this occasion, Microsoft organized an awarding ceremony for Microsoft YouthSpark Scholarship for Female students in Technology. 80 outstanding female students majoring in Computer Science from top 8 universities in Vietnam won Microsoft scholarship for their great effort in pursuing their passion in technology. Phan Thi Hong Hanh, a student of Poli-technique University has shared her experience in encouraging her female colleagues, to pursue their aspiration and dream. By learning hard to have good of technology skills and knowledge, they will enhance women's role in the development of Computer Science and ICT in the future. YouthSpark was launched in 2012 with the aim to support 300 million youth all over the world to capture opportunities. To date, the program has achieved great outcomes. YouthSpark has cooperated with 350 non-profit partners and supported more than 227 million young people in more than 100 countries in the world including Vietnam. From September 2015, Microsoft announced an additional funding commitment of USD 75 million in the next three years to expand YouthSpark to bring computer science to all young people in the world, especially disadvantaged youths.